In the wake of a major flip-flop by Hillary Clinton as to whether she would or would not issue an apology over "Emailgate", I thought it might be interesting to review the details and denials from the beginning. From 2009 to 2013, when Hillary Clinton was Secretary of State, she sent and received emails using a home-brew email server setup in her house. This was a violation of protocol as she was supposed to use secure government channels. Her use of a private server and email account prompted congressional and FBI investigations. She denied any classified documents were on her server, but a quick check proved otherwise. Despite all of her efforts, the server story will not go away, it has been in the news for months, and Hillary's popularity has plunged. 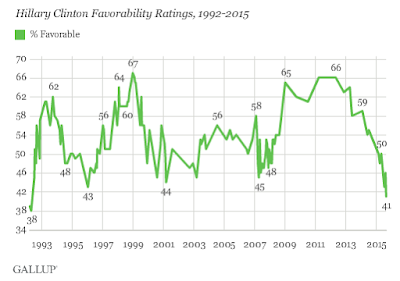 Dogged by continued scrutiny of her email practices as secretary of state, Democratic presidential candidate Hillary Clinton's favorability with the American public has sunk to one of its lowest levels in Gallup's 23-year trend. Currently, 41% of U.S. adults say they have a favorable opinion of the Democratic front-runner, while 51% hold an unfavorable view. Clinton's sub-40% favorable ratings in 1992 were mostly a product of the public's lack of familiarity with her, rather than any kind of broad unpopularity. By contrast, her current 41% favorable rating is arguably her worst, given her nearly universal name recognition. Her present rating is about as low as it was in March 2001, during her first few months in office as a U.S. senator from New York. Perhaps more importantly, it was also after controversial pardons that her husband, President Bill Clinton, granted at the end of his presidency, and after the Clintons took furnishings and other gifts that were White House property when they left. "I did not send or receive any information marked classified. I take the responsibilities of handling classified materials very seriously and did so," said Hillary. Flashback March 10: Hillary Clinton Tries to Quell Controversy Over Private Email. Hillary Rodham Clinton revealed on Tuesday that she had deleted about half her emails from her years as secretary of state, saying she had turned over to the Obama administration all correspondence about government business but had erased records of communications about private matters, like yoga routines, her daughter’s wedding and her mother’s funeral. “I thought it would be easier to carry just one device for my work and for my personal emails instead of two,” she explained. Flash Forward September 4, 2015: The Hill reports Hillary Clinton refuses to apologize for email choices. Hillary Clinton on Friday declined on two occasions to apologize for using a personal email account and server while serving as secretary of State. In an interview last Friday, Clinton offered a quasi-apology. “At the end of the day, I am sorry that this has been confusing to people and has raised a lot of questions, but there are answers to all these questions,” Hillary Clinton told NBC’s Andrea Mitchell in an interview last Friday, when asked whether she should apologize for the email controversy dogging her campaign. On September 8, Bloomberg reported Hillary Clinton Offers Apology for E-Mail Practices. "That was a mistake. I’m sorry about that. I take responsibility,” she said in an interview with ABC’s David Muir [on Tuesday]. Clinton said she regrets how she's handled the e-mail issue since her use of a private account first came to light six months ago. “I do think I could have and should have done a better job answering questions earlier. I really didn’t perhaps appreciate the need to do that,” she said. Lets' go over that last paragraph above one more time. Hillary did not "appreciate the need to do a better job answering questions" about why she used a private email server when she should not have, about denials of classified documents on the server, and about all kinds of inconsistencies in her make-up-answers-as-you-go-along story. March 10: New York Times: Hillary Clinton Tries to Quell Controversy Over Private Email. August 11: McClatchy: Clinton probe expands to key aides. August 17: Washington Times: 305 Documents With Potentially Classified Information. Key Idea - 5.1 percent of emails processed so far — have been flagged for potential secret information, the State Department reported to a federal court Monday. September 8: Bloomberg: Hillary Clinton Offers Apology for E-Mail Practices. Hillary Clinton's approval rating was over 60% in 2013. It's near a record low 41% now. Lies are the reason. "While many were never going to look past my 2002 vote no matter what I did or said, I should have stated my regret sooner and in the plainest, most direct language possible. I’d gone most of the way there by saying I regretted the way President Bush used his authority and by saying that if we knew then what we later learned, there wouldn’t have been a vote. But I held out against using the word mistake." Hillary "regrets the way Bush used his authority". What kind of apology is that? Heck it's not even an admission of a mistake. I have always maintained that Hillary would have won the Democratic nomination in 2008 over Obama had she only had the common sense to admit she made a mistake in siding with President Bush on the War in Iraq. I made that claim in 2008, well before Hillary realized it. Moreover, I highly doubt she believed the ridiculous evidence Bush presented in the first place. Rather, I strongly suspect she believed in war-mongering and nation-building. There was never any evidence, just easy-to-see lies. Most of our allies laughed at us. It did Hillary no good to issue a half-baked apology in her self-serving book on "Hard Choices". By once again refusing to apologize or admit a mistake in a timely fashion, she may have done it to herself once again.